We apologize for the hiatus in recipes, needless to say we’ll be making up for that daily! We’ve been going through some advanced planning for the website and other extensions of Food Made Fabulous! Thanks for continuing to follow us! 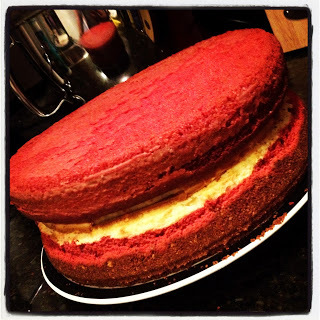 And for your patience we bring the Ultimate Red Velvet Cheesecake recipe!!! I like to start with the cheesecake! We’ll start with the crust! Preheat your oven to 350 degrees F. Mix the cracker crumbs, melted butter, sugar, salt and cocoa in a bowl. Press into the bottom and 1 inch up the side of a 9-inch springform pan. place your newly pressed crust in pan on a baking sheet and bake until set, about 10 minutes. Let cool completely, which only takes about 7 minutes. Now start your filling! Reduce the oven temperature to 325 degrees F. Beat the cream cheese, sugar, lemon juice and vanilla in a standing mixer fitter with the paddle attachment until smooth, 4 to 5 minutes. Add the flour, then beat in the eggs one at a time, beat for 3 minutes. Transfer 2 cups of batter to a bowl; stir in the cocoa powder and food coloring. Pour the red batter into the crust, then pour the white batter on top. Using a spoon, pull some of the red batter up from the bottom of the cake and swirl. Bake until the edges are set but the center is still wobbly, about an hour, 20 minutes. Turn off the oven but keep the cake inside to cool, about 20 minutes. Run a knife around the edge of the pan, don’t remove the springform side AND be careful not to slice your crust off your cake! Transfer your cake to a rack to cool. Refrigerate at least 4 hours before removing from the springform pan. Now we shall begin our Red Velvet Cake! Preheat oven to 350 degrees F. Grease and flour your 9-inch springform pan. Sift flour, baking soda and coco together. beat sugar and eggs together in a standing mixer fitted with the paddle attachment. In a separate bowl mix together oil, vinegar, food coloring and vanilla. Add to the bowl of eggs and sugar and beat until combined. Add the flour mixture and the buttermilk to the wet mixture by alternating the buttermilk and dry ingredients. Always start with the flour and end with the flour. Pour the batter into the pan. Tap the pan on the table to level out the batter and release the air bubble. Bake for 45 minutes or until a cake tester inserted near the middle comes out clean but be careful not to over bake or you’ll end up with a dry cake. Let the cake cool on a wire rack for about 15 minutes before opening the springform. Cool completely before frosting! This is the only cream cheese frosting recipe allowed in my house! Let the butter and cream cheese soften to room temperature. Cream well. Add sugar and beat until mixed but not so much that the frosting becomes loose. Add vanilla. 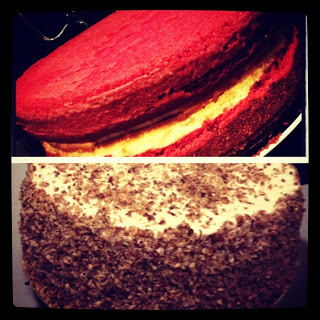 Spread between the cheesecake and red velvet cake and on top and side of the cake. Refrigerate your cake until your frosting is kinda still, about an hour. 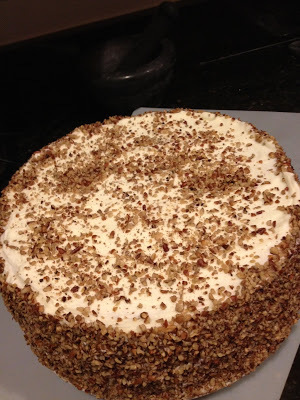 Now you can choose to either roll your cake in the pecans or pack the sides and the top of the cake with pecans. You can refrigerate once more to allow the pecans to set or you can serve! Enjoy your fabulous cake!